We have been here before on the west side of Grosvenor Square, between the former Eye Hospital and Registry Office on Lower Ormond Street, sits the solid stolid brick form of St Augustine. The original St Augustine’s was one of the oldest Roman Catholic churches in Manchester, having been established at Granby Row in 1820. This church was sold in 1905 to make way for the Manchester Municipal Technical College, and a new church built on York Street. 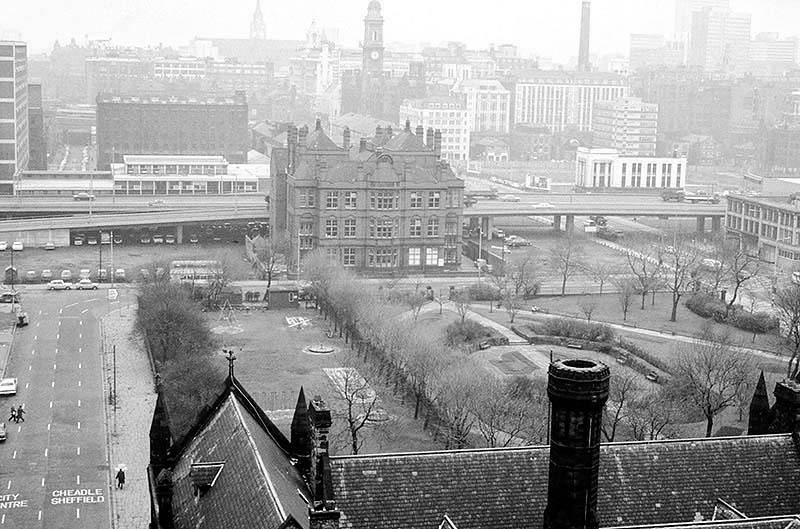 This church was destroyed in the Manchester Blitz of 1940. The present site previously housed a chapel of ease in a building bought from the Methodists in the 1870s. It had briefly been a separate parish, but in 1908 was amalgamated with St Augustine’s parish. After the War it was the only surviving church in the parish. The new St Augustine’s was built here with the help of a grant from the War Damage Commission, at a cost of £138,000, when it was clear that the original building was inadequate. The new building was opened in 1968 and consecrated in 1970. Quite rightly listed by Historic England. Roman Catholic Church 1967-8 by Desmond Williams & Associates. Load-bearing dark brown brick construction with felt roofs supported on Vierendeel girders, with rear range in brick and timber cladding. Body of church virtually square, with corridor at rear right leading to cross wing containing offices and accommodation. Windowless façade with floating service projection to the left and four full height brick fins to the right of wide recessed central entrance reached by low flight of steps. On the projection a ceramic plaque with star and mitre and on the inner face of the left hand fin a figure of the Madonna, both by Robert Brumby. Set back returns of 6 bays, divided by pairs of projecting slim brick piers. Openings between the pairs of piers filled with coloured chipped French glass. Secondary entrance beneath large cantilevered canopy in first bay of left hand return. Slender linking block containing sacristy. The rear presbytery range, containing first floor hall, meeting rooms, kitchen, chaplaincy offices and accommodation for four priests. Bell tower rising from parish rooms block. A simple box plan with ceiling of steel trusses clad with timber and clerestory north lights. Sanctuary of three stepped platforms with white marble altar set forward. Large ceramic reredos sculpture of Christ in Majesty by Robert Brumby of York. Bays containing either projecting confessionals or chapel recesses are divided by pairs of projecting slim brick piers. Fixed seating in angular U-shape surrounding Sanctuary. Side chapel to left. Narthex. West gallery above originally with seating, now housing organ. Unified scheme of decoration by Brumby including the external plaque and statue, holy water stoups, wall light brackets, circular font with ceramic inset and aluminium lid, altar table with bronze inset and, probably, Stations of the Cross sculptures. Also by Brumby, a memorial plaque fashioned from mangled plate, damaged in the Blitz, commemorating the earlier parish church which this replaced. Of particular note are the stained glass windows. The internal atmosphere of the church is modified by the changes in light cast through the stained glass windows. The windows are of a colourful random and abstract design and ascend the full height of the walls between structural bays which themselves form enclosures to confessionals and stores. The pieces of coloured glass are suspended in concrete and were supplied by the now defunct Whitefriars company. The designer was a French artist, Pierre Fourmaintraux, who began working with Whitefriars in 1959, using the ‘dalle de verre’ (slab glass) technique that had been developed in France between the wars. His motif was a small monk variously painted upon, or cast into, the glass. In St. Augustine’s the motif is cast and highly stylised and can be found tucked away at the foot of each of the rear windows. Situated in a prime location between King Street and Market Street, Lowry House is convenient for Manchester’s main financial district as well as being adjacent to the city’s main retail core. Well-positioned for a range of quality eateries and public transport connections at Piccadilly Gardens, the building is a great choice for businesses looking to create a quality impression. Part of Bruntwood’s extensive property portfolio across the city. Painfully modern and anonymous interiors for the modern business – this could be your dream location. This area has been at the vortex of power and wealth for over a hundred years. Narrow winds enclosing light and space. Controlling pounds, shillings and pence. The final withdrawal has been made. The ATM encased in oxidised steel. The Nat West has gone west. Rust we are told never sleeps. Built in 1973 by architects Robert Swift and Partners, renovated in 2006 by Bruntwood, adding cladding and a certain je ne sais pas. I do admire its precast modular lift and mass almost towering over its surroundings. The late afternoon sun adds a certain beguiling warmth to the pale pinkish concrete. Take a swerve off of the hustle and seemingly unnecessary bustle of Market Street and marvel at this Marble Street structure. Let’s follow in the imaginary footsteps of Manchester man Thomas de Quincey. No huge Babylonian centres of commerce towered into the clouds on these sweet sylvan routes: no hurricanes of haste, or fever-stricken armies of horses and flying chariots, tormented the echoes in these mountain recesses.